I’m so excited to have Susan of Cook the Stone share one of her recipes today. I’m trying to get a big project done for school, get a big project finished for my kids physics class and try to juggle a busy day at work and home. So thank you for coming to my rescue today! It’s that time of year that zucchini is probably coming out of your ears right now and it’s always fun to try to find new ways to use it up. These grilled zucchini wrapped shrimp are the perfect way for you to use up your zucchini in a light meal that tastes fantastic. A special thanks for helping us out today and enjoy this delicious and nutritious appetizer you can have ready in under 30 minutes! Since it is summer, I guess many of us have noticed the abundance of zucchini in the local markets. Let’s say that you bought a kilo or so of zucchini. What would you do with it? There are plenty of ways to eat zucchini. You can even eat it raw. Some people use it to make bread. Others use it in soup and pasta. In this article, I will teach you how to use zucchini for an appetizer. Grilled zucchini wrapped shrimp is a super healthy, refreshing and filling appetizer. It is a good appetizer dish that you can prepare for any party. Your guests will love this idea of grilling zucchini with shrimp. Zucchini is a summer squash that’s healthy and versatile. It goes by different names like vegetable marrow in Britain and courgette in France. It is part of the species called Cucurbita pepo which also includes cucumbers. Speaking of cucumbers, zucchini is usually mistaken for its cousin because of their looks. And I can’t blame people who often get confused with these two veggies. Both zucchini and cucumber have the same skin color (dark green), same long cylindrical shape, and pale and seedy flesh. But when you touch them, you would realize that cucumber and zucchini are worlds apart regarding texture. Zucchini has a rough and dry exterior. Cucumbers, on the other hand, have a cold exterior. Zucchini is widely grown in Italy, China, Japan, Romania, Turkey, and Egypt. In the Americas, Argentina is the top producer. This summer vegetable has been around for quite a long time. In fact, several types of research have indicated that zucchini has been consumed by humans as early as 5,000 years before the birth of Christ. The early human civilizations in the Americas were believed to be among the first to cultivate this vegetable. What are the health benefits of zucchini? Like most vegetables, zucchini is packed with nutrition. It is high in dietary fiber but low in calories. It is packed with vitamins A and C as well as carbohydrates, potassium, and protein. This is one of the best vegetables to eat for people wanting to lose weight. You can substitute zucchini for calorie-rich foods so that you can limit the calories that you take in. The high fiber content of zucchini also helps it in burning fats. Your heart will also benefit from your consumption of zucchini. A cup of this vegetable contains 300 milligrams of potassium, which is around 10% of the recommended daily allowance. Potassium negates the effects of sodium in the body and thus aids in lowering blood pressure. Finally, zucchini is rich in vitamin C that prevents and treats colds and coughs. The said vitamin is also essential in lowering blood pressure. A cup of zucchini has about 33% of the recommended daily value of vitamin C.
What are the health benefits of shrimp? 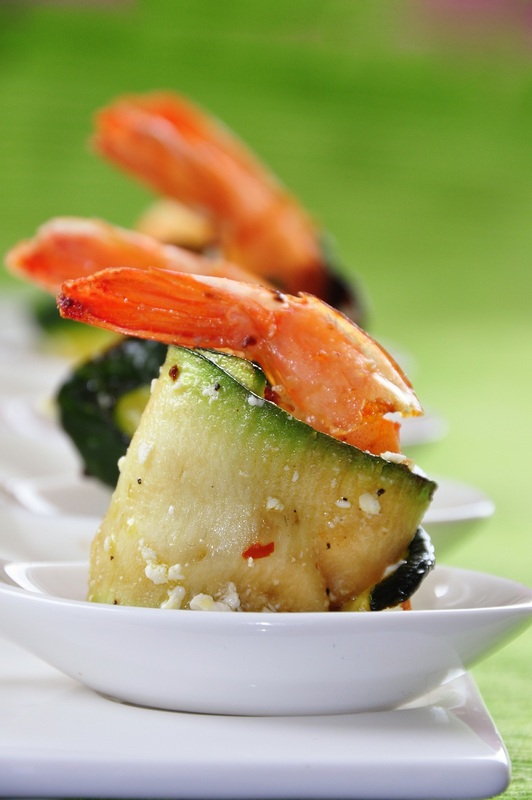 Pair zucchini with shrimp and you would be getting an appetizer that is a nutrition powerhouse. Shrimp is not only easy to cook but is also high in nutrition. Like zucchini, shrimp is a good weight loss food. It is loaded with zinc, which can increase the levels of the hormone leptin in the body. Leptin has been found to aid in the regulation of fat storage, energy expenditure, and appetite. Scientists believe that insufficient amounts of this hormone cause food cravings and overeating. It also has a carotenoid called astaxanthin that protects the skin from premature aging. Shrimp also has lots of omega-3 fatty acids that fight off free radicals. Copper is also found in shrimp which can prevent hair loss and enhance hair color. Selenium is another mineral that is found in shrimp. This trace mineral can reduce cancer risks, particularly lung and prostate cancers. In fact, numerous population studies have shown that risk of death from cancer is significantly lower in areas where selenium is abundant. 2. Combine the lime juice with three tablespoons of vegetable oil, garlic cloves, salt and red pepper in a zip-top plastic bag. Gently squeeze to blend before adding the shrimp. Seal and chill this mixture for about 15 minutes. 3. Take out the shrimp from marinade. Pour half of it into a bowl, then pour the other half in a small pan and bring it to a boil. 4. Cut the zucchinis into thin slices. Wrap each shrimp with a slice of zucchini. Use a wooden pick to secure the shrimp. Then brush each roll with the remaining tablespoons of vegetable oil. I suggest you to use vegetable slicer to have a perfect thin zucchini slices. However, it’s fine to use a sushi knife to cut zucchini. 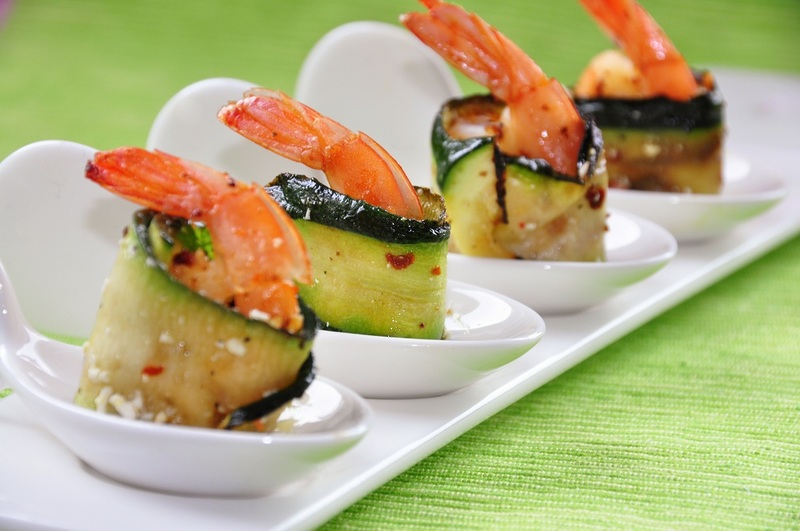 You will be amazed at the nice and thin slices of zucchini which are also needed to wrap the shrimp easier. 5. Grill the rolls over medium-high heat for around 4 minutes. 6. Brush the rolls with the reserved marinade. Turn and brush again. Grill these for two more minutes. Serve hot or at room temperature. This grilled zucchini wrapped shrimp is so easy to make that you should be able to finish it in less than 30 minutes. It’s a delicious and nutritious appetizer that you can serve anytime of the day and especially, a perfect choice for a special day. How do you find this recipe? Let me hear your thoughts on the comments section below.